The two benchtop single-phase Digital Power Analyzers are fully loaded with measurement features you''''d expect on instruments costing three times the price. Both units boast twin high resolution 4 1/2 digital displays, DC to 50 KHz frequency response, true power measurement, true RMS voltage and current and built-in peak overload indicators. The only difference between the two units are their respective voltage ranges. The 2100 offers 600, 300 and 150 volt ranges while the 2101 features 300, 150 and 30 volt ranges. 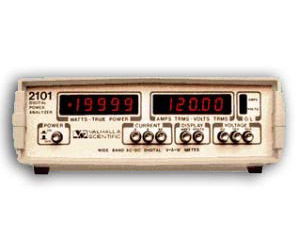 The Valhalla 2100 series power meters are also great measurement instruments for college and university motor test laboratories.